Each player controls the fate of a family and wants to rise to prominence. But never forget the most important thing: Time cannot be stopped, and eventually family members pass away. Those that worked hard during their lifetime may find themselves immortalized in the village chronicle and thus increase their families' fame. Village is a game full of tactical challenges. 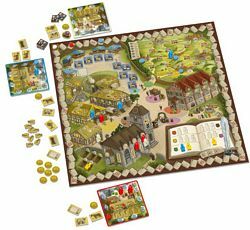 A clever action mechanism ensures that each turn is brief and still full of tricky decisions. Noteworthy is also the way the game deals with the subject of death. As a natural part of life, it is a frequent guest in the village and requires especially one thing: smart time management.